The Panasonic Shinobi Pro is a value for money smart TV, with very good picture quality and sound. It is one of the few high definition TVs that can do well with SD content, and you also won't need extra speakers with this. It's not a very premium looking TV, though, and the Smart OS isn't ideal. Panasonic is the grizzled veteran of TV technology. The company has been steady, and while it doesn’t always have flashy new marketing jargon to throw at you, it has produced quality televisions often. The newest in Panasonic’s India endeavours is the Shinobi Pro series, which sits below its Viera line. 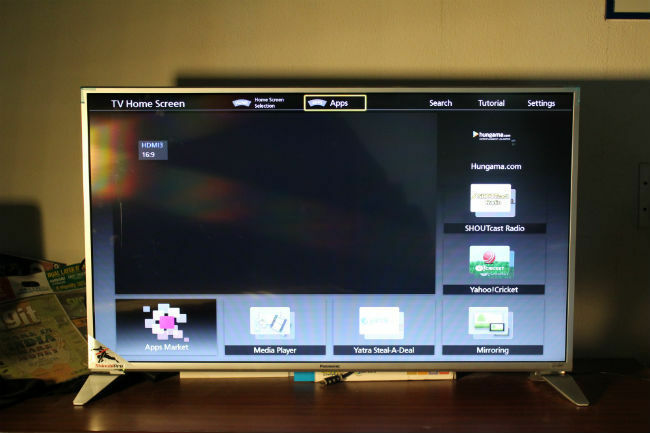 The 43 inch Shinobi Pro TV we reviewed is a Smart TV, but it has Panasonic’s own take at smart, rather than going the Android, WebOS or Tizen way. The 43 inch Panasonic Shinobi Pro isn’t exactly a looker, but it’s not something you would call pedestrian either. Panasonic’s product page for this TV calls this the “silver design”, referring to the silver trims around the TV. With the right lighting, it can have a metallic shimmer, but the trims are made of plastic, and otherwise look middling. It neither look uber premium, nor cheap. The TV doesn’t carry a slim profile either, like some others in the premium range, but there’s little to question. 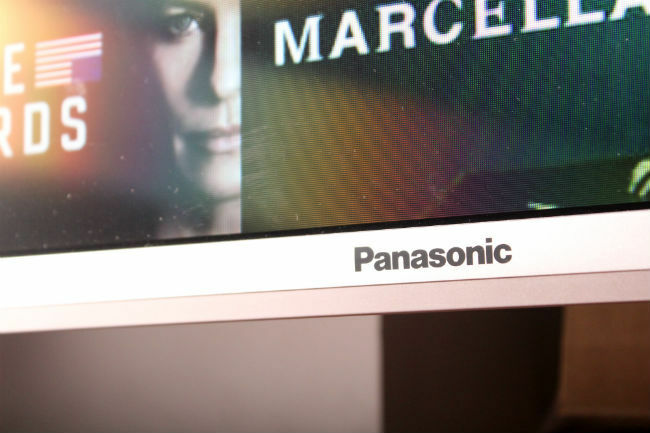 The Panasonic Shinobi Pro is a plain jane television, that focuses more on picture quality than peripheral looks. But we’ll get to that later. From a build and design point of view, the Panasonic Shinobi Pro is a simple TV, which will fit most setups, but not really add a lot to your media centre, in terms of premiumness. And that is perfectly fine for many. The 43 inch variant doesn’t have a big footprint, though, which may bother some. Being a 1080p TV, Panasonic has dropped USB 3.0 ports, going instead with two USB 2.0 ports on the side. We would have liked another one, but two are enough for most. One of the HDMI ports have also been placed on the side, for easier connectivity, while two of them are on the back console. There’s also an Ethernet port on the back, for connecting a LAN cable if needed. 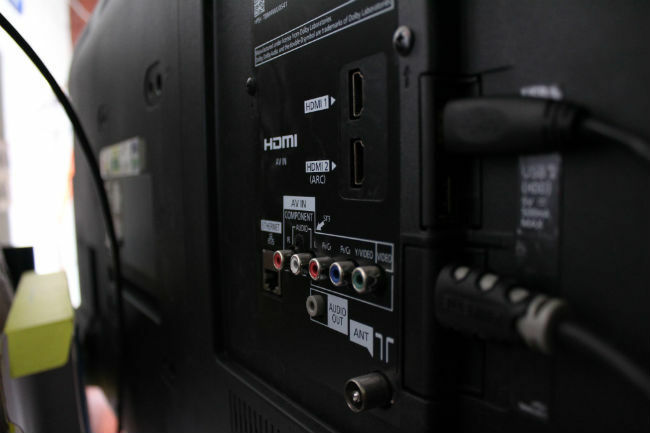 If you’re wall mounting the TV, we’d recommend using the two HDMI ports on the back for permanent connections, like set-top-boxes. Panasonic’s top end TVs run a version of Firefox OS, but it’s not clear whether the Shinobi series is powered by the same. It looks quite like Firefox, though, and the Smart OS is nowhere close to being as intuitive and smooth as Android TV, Tizen or WebOS. It’s slow, and apps take quite some time to load. Not many are available either, but that’s true for every smart OS for TVs right now. The 43-inch Shinobi Pro has a dedicated Netflix button, which allows you to call the Netflix app from anywhere. You can also download the Hungama app, WWE Network and more. That said, the experience isn’t very seamless. It feels more like a step back from other, better built smart operating systems. Typing using the remote is a pain and you’ll wince each time you make a mistake. 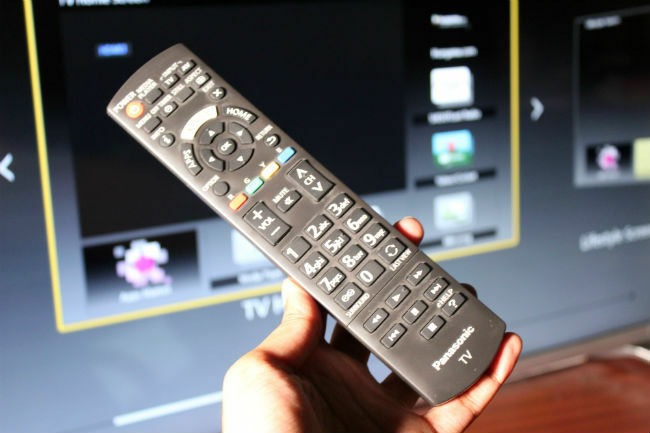 The TV connects to the Internet using WiFi, and you can also use the Ethernet port as well. This is where the 43-inch Panasonic Shinobi Pro makes its case. The picture quality on the television is impeccable. We saw a little noise on some content, but that boiled down to the quality of content being delivered. Streaming on Netflix, or watching other high quality 1080p content, this TV does wonders with the colours. Panasonic’s Hexa Chroma Drive is used to provide a wide colour gamut, and it does a very good job of it. While the TV doesn’t have the highest contrast ratio, 480:1 at 50% brightness is enough for most. The vivid colours make skin tones look a tad oversaturated, but it’s what most people enjoy. The Panasonic Shinobi Pro doesn’t have perfect Black levels, but we never really cared about it, because the overall colour gamut is represented very well, and balanced. Panasonic has also reduced motion blur by using Backlight Scanning technology. 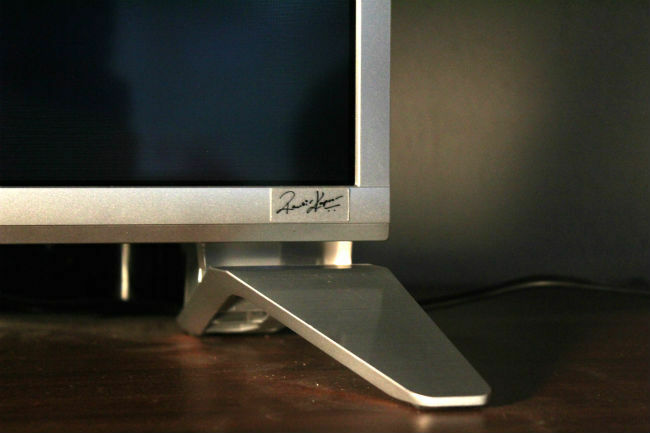 The company advertises a panel drive of 200Hz, which doesn’t represent the actual refresh rate (the native refresh rate is 60Hz). Rather, the backlights are constantly flickering, showing each image multiple times. This doesn’t register to your eyes, but the result is smooth blur free picture while gaming. Lastly, one of the best elements of the Shinobi Pro TV is that it’s great for SD television viewing. 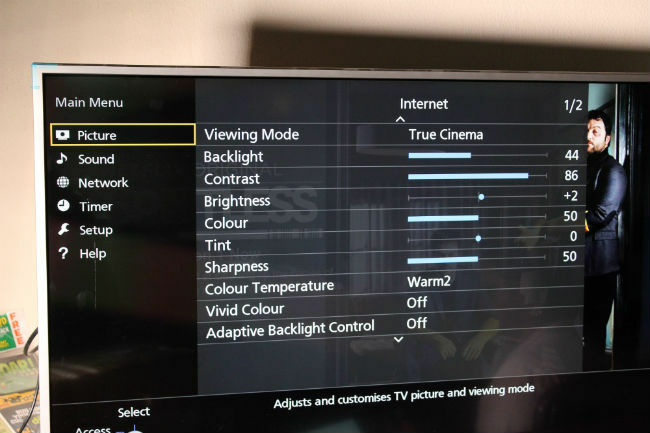 Hexa Chroma Drive plays a role here as well, and SD TV channels, and even the poorly done HD channels, look good because of the colour reproduction. Yes, the resolution is lower than HD, but it looked better than on other smart TVs, most of which struggle with SD content. The picture quality is complemented by the audio quality. On paper, two 10 Watt speakers don’t sound like much, but Panasonic says this TV has a home theatre built in. That may be an overstatement, but the audio quality of this TV is great. It would fit large rooms alone, without additional speakers, and the audio is crisp. The bass is somewhat subdued, but the overall audio quality is perfect for voices, which is more important for televisions. At Rs. 60,900, the Panasonic Shinobi Pro is a 43-inch TV meant for those who actually watch television. The fact that it suits other content and gaming is a bonus, but this is truly a TV for the regular consumer, with his beloved set-top-box. It’s selling on Flipkart for Rs. 51,989, which is a great price for such a television. The Smart OS is disappointing, but it just about does the job, and the picture quality is beyond question.